It’s deep winter—half of the country spent last week in a polar vortex, and you’ve likely been wearing two pairs of long underwear and digging the ice out of your guides since November. That being the case, if you’re looking for something to do in February that doesn’t require 45 minutes of mental preparation with the heat on full blast in the truck, we have a suggestion to offer: The Flyfishing Shows. While attending three of the seven shows last year (in Edison, NJ, Atlanta, GA, and Seattle, WA) to represent The Flyfish Journal, I was able to check out companies I’d never heard of and chat with the representatives of those I’ve known about for years. I cast next season’s rods, gawked at a whole lot of waterproof backpacks (I’ll get one someday) and might have fangirled Hilary Hutcheson at the Patagonia booth. I reveled in the opportunity to learn about fisheries in parts of the country I’d never considered to be particularly “fishy,” places like the bays adjacent to New York City and the inland lakes of Georgia and Alabama. 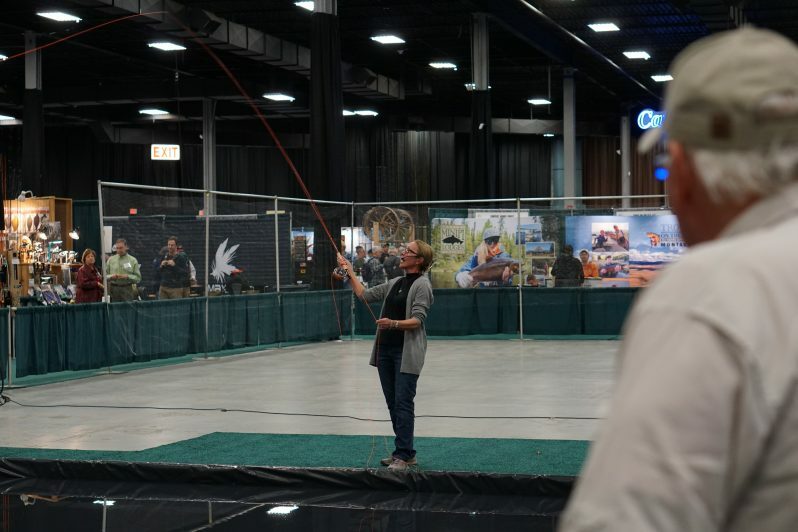 When I wasn’t at The Flyfish Journal booth or handing out magazines, I checked out classes taught by local anglers, tying clinics with renowned fly tiers and casting clinics with some of the most well-known anglers in the industry. Four iterations of The Flyfishing Show have already taken place this year, but you can still catch stops in Lynnwood (Seattle), WA, Pleasanton, CA, and Lancaster, PA. Dates and locations for upcoming shows can be found on The Flyfishing Show’s website. You can also check out our video from the 2018 Flyfishing Shows here.